From start to finish, check it out! This recipe is a gem. Not only is it a healthy snack, this is one that is enjoyed by everybody (picky eaters AND those who’s taste buds are used to the standard American diet). Slice apples. Keep the skin on! It is packed with nutrients. Pictured are slices that are about 1/8″ thick. Place in a bowl. Discard apple core into the compost. 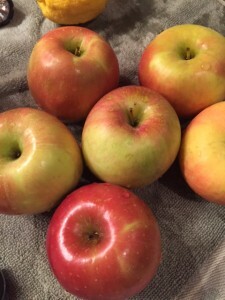 Apples are high in fiber and antioxidants. On average, Americans are not eating enough fiber during the day. On a sidenote… if you are looking for ways to reduce your calorie intake during the day: Set aside a raw apple or two. Eat 1 about 15 minutes before a meal. Researchers report that healthy adults consumed 15% less calories during that meal. Squeeze lemon over the apples and toss. 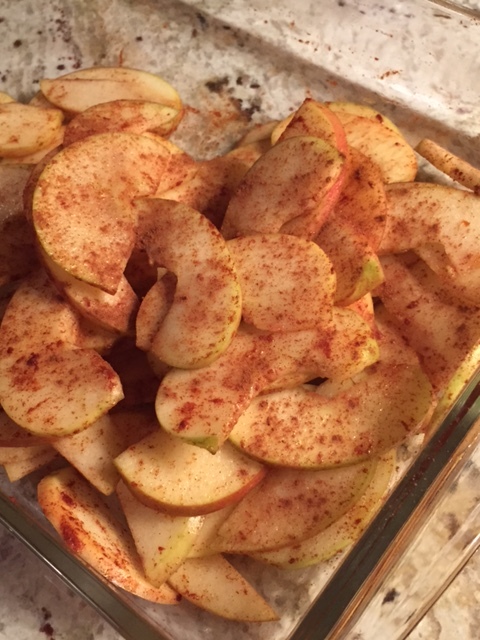 The citric acid of the lemon will prevent the apples from browning. I don’t measure. 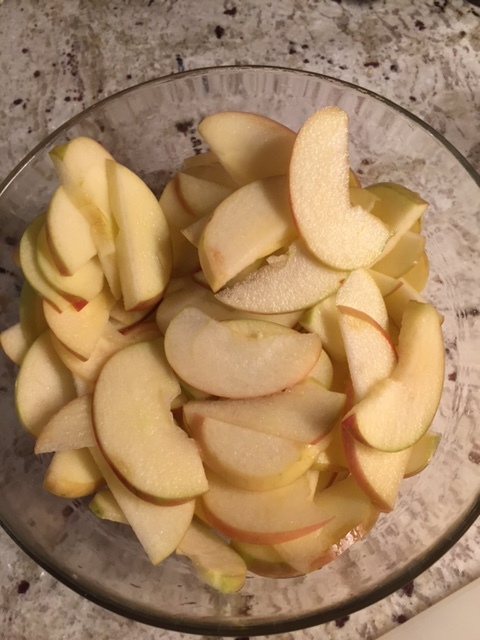 Visually, I squeeze enough juice to cover all the edges of the apples. 1-2 lemons usually works. Lemons are an excellent source of Vitamin C and supports health immune function and detoxification. 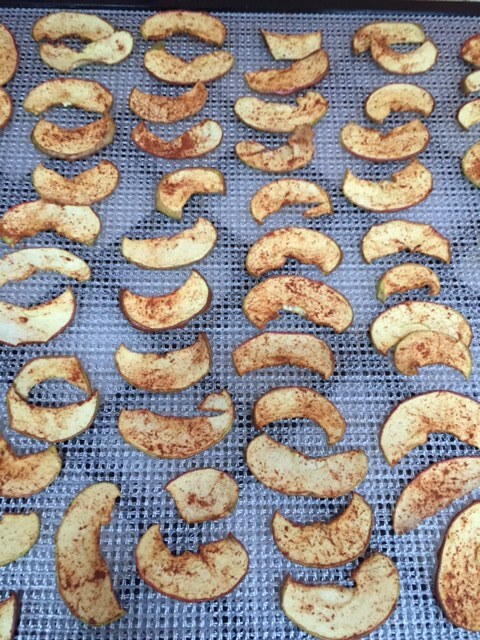 Sprinkle cinnamon all over the apples and toss. This spice is a great source of magnesium and supports health blood sugar levels. Lay apples on the trays. Pack them in tight. 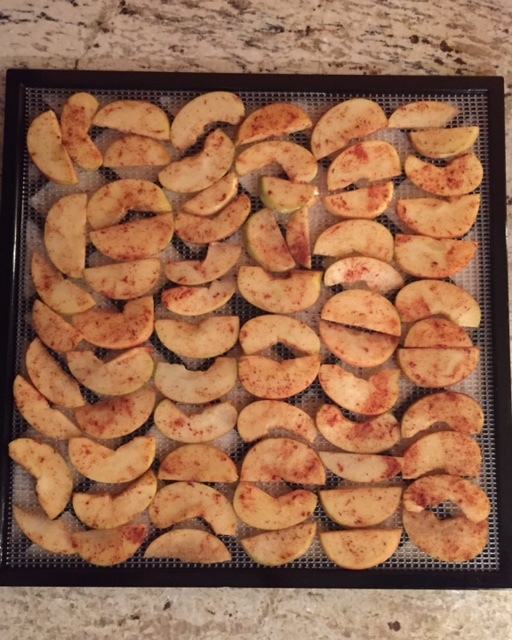 If you have never used a dehydrator before, you will be shocked to visually see how much water fresh fruits and vegetables actually contain by seeing how small they are when they are done dehydrating. 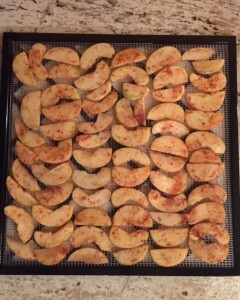 Set dehydrator to the temperature of 105 degrees Fahrenheit. This setting is a low temperature setting to remove the water, keep the enzymes alive and to keep the high value of nutrition it contains. Time varies: 6-8 hours. I occasionally open it and sample them until the desire texture. 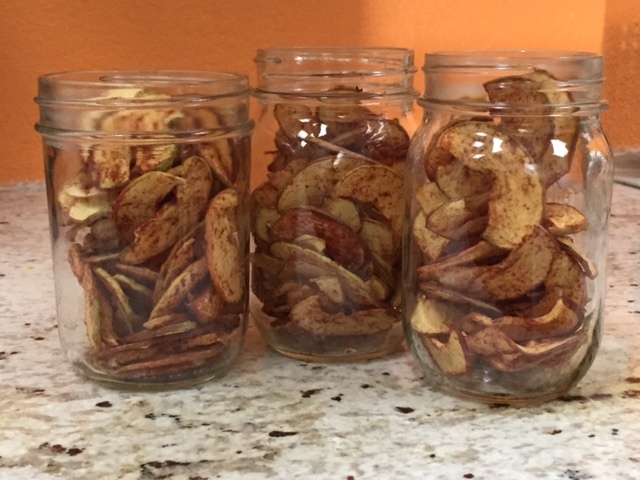 Apples will not dehydrate into a “crunchy” chip. They have a slight give to them. Pack it up! I prefer using glass containers. Glass is a more sustainable source than using plastic. Replacing processed snacks at home or office. On a road trip to prevent buying sugary and salty snacks at gas stations. Chopped and mixed with raw nuts as a trail mix. Chopped and sprinkle on salads to add natural sweetness and replace sugared dried cranberries. As a gift to replace a box of chocolates. Enjoy! Love to know what you think and if you have tried another recipe version for dehydrated apples.